In this workshop we will listen to, and attempt to think through, archival recordings from the Poetry Project’s extensive collection housed at the Library of Congress. We will aim to bring to craft a collective language for talking about readings: what is happening at a reading? How might we develop an historiography of listening? 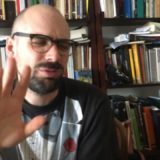 How are voices preserved, ignored and, at times, actively suppressed? How does close listening (to tone, to banter, to heckling, applause, echo, vocal gesture) help us to understand not only the archival and institutional record, but our own poetics? How can we theorize the grain of the voice while contextualizing and historicizing it? What social solidarities come to bear on the reading, the talk, the workshop? We will be listening to previously unheard recordings of readings and talks by David Antin, Cookie Mueller, Audre Lorde, David Wojnarowicz, John Wieners and more TBA. 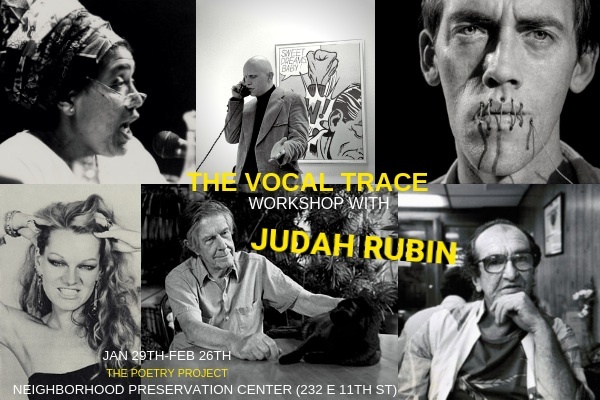 Judah Rubin is a poet, educator, cataloger, and former Monday night coordinator at the Poetry Project. He is the editor of A Perfect Vacuum, a magazine of poetry and poetics.